Our Cruise and Stay holidays to Port Aventura will give you the opportunity to visit the biggest theme park in Spain! You can also explore the surrounding area which includes some beautiful beaches and towns and cities such as Salou and Barcelona. Our Port Aventura Smart Packages all include a cruise from one of the biggest cruise ports in the Mediterranean, Barcelona, which features for hundreds of sailings every single year. This means that you get a massive choice on cruise lines to sail with throughout the year. As well as getting a FREE stay in one of our hand-picked hotels ideal for exploring the area, with our Port Aventura Cruise & Stay packages your flights will always be included. We also offer flights from a number of regional airports throughout the UK giving you much greater flexibility and making your holiday experience as smooth as possible. Port Aventura is southern Europe’s biggest theme park. Located just outside Salou, it makes the perfect exciting get away from the relaxation of the sun, sea and sand. PortAventura is southern Europe’s biggest theme park. Ever year it attracts an astounding 4 million eager visitors who can’t wait to see what it has to offer. Located just outside Salou, it makes the perfect exciting get away from the relaxation of the sun, sea and sand. It consists of six different areas including the Far West and China. Each area homes rollercoasters and rides in keeping with the theme of the area. Dragon Khan, a favourite among many, with its 8 inversions is a stone throws away from Shambala, Europe’s fastest rollercoaster. These very popular rides can be found in China. If twists and turns aren’t your thing, there are numerous stage shows including Templo del Fuego, a high-quality Indiana Jones-esque show where you’re lucky to get out alive. Away from the high intensity rides is SesamoAventura, a Sesame Street area aimed at the younger audience. It has 11 rides making it the ideal area for families with younger children. And who knows, Ernie, Bert and Elmo may make a special appearance just to see you! PortAventura really is the theme park for all ages. It covers each aspect needed for a great day out with plenty to keep you busy and plenty of restaurants to stop you from going hungry. It’s where you can immerse yourself in your favourite red super car. Each aspect of the park is inspired by Ferrari and its home, Italy. With Rome’s Colosseum and Venice’s St Mark’s Campanile, you’ll feel like you wandering through the streets of Italy instead of Costa Daurada. Accompanying the wonderful theming is ride after ride created with Ferrari in mind. Thrill rides are a must with Red Force and Free Fall Tower being a good place to start, once you’ve got your adrenaline pumping why not try out the Ferrari Experience where you can live out your Formula One dream. This waterpark delivers everything you could need after a long day in the park. There’s El Rio Loco, a lazy river style ride with twists and turns and the unexpected obstacle. If you’re missing the sandy beaches of Salou, there’s Bahama Beach, a place you can relax and rewind on the many sun loungers. As well as all the relaxing aspects about this park, there’s also 17 rides which will get the pulse racing. With various shows, rides and activities you can easily lose a day here admiring Seasame Street. 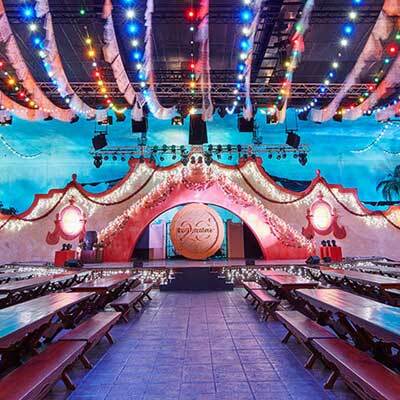 Shows take place throughout the day and you’ll be able to find all of your favourite characters on stage. Why stick to one cuisine when you can sample them all? 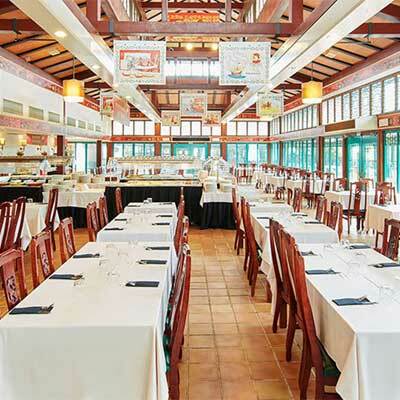 Marco Polo buffet offers an eclectic range of foods from all over the world. After a busy day exploring the park, an all you can eat buffet is the perfect way to refuel before you go and explore the rest of the parks. Bora Bora offers an international kitchen with Polynesian style twists. 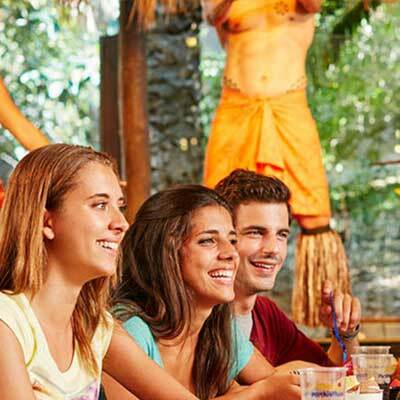 A show goes on in the background as you step into Polynesia with the food and culture. Find Bora Bora located outside Aloha Tahiti, an amazing Polynesian dance show. Tuck into your nachos in this wonderfully themed Mexican style restaurant. As you walk through the imposing entrance a wonderfully bright, colourful room awaits you. With dance shows going on throughout the day, you can tuck into your burrito whilst feeling like you’re eating in Mexico. Fancy doing some line dancing after you’ve eaten? The Old Steak House is the place for you. Located in the Far West, this restaurant delivers home style American cooking with Nashville’s dancing atmosphere and country music. 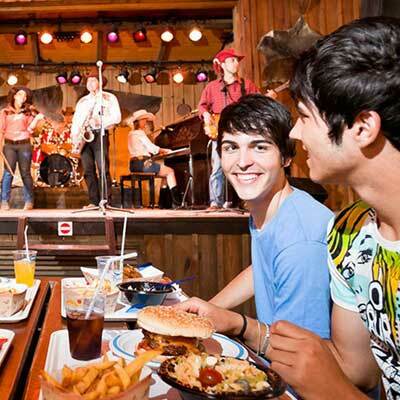 Tuck in to burgers, ribs and fries whilst learning how to line dance. Discover incredible value and huge savings with our Port Aventura Cruise & Stay Deals! Halloween reaches PortAventura in late September. Get involved with Bert and Ernie in SesamoAventura or watch a ghoulish show. Halloween is the holiday for everyone. 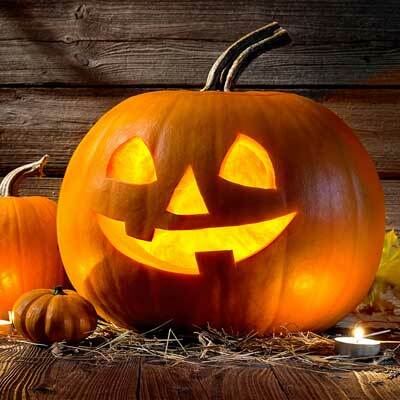 Splendidly designed from show to parade, Halloween hits all the right notes. 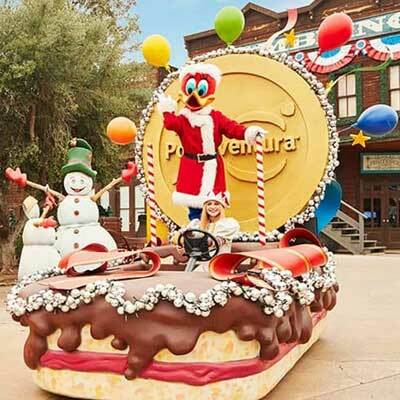 Every year Christmas comes early in PortAventura with various Christmas events running from 24th of November. From parades to shows, Christmas is a great time to visit PortAventura. Woody Woodpecker, the park’s mascot, dons his Santa outfit and rides through the streets on a Christmas themed float. The park itself is transformed with Christmas decorations and music. And if you’re lucky enough to be there on select dates in January, the Kings of the East visit PortAventura to collect children’s letters and give out sweets to the children who have been food through the year. 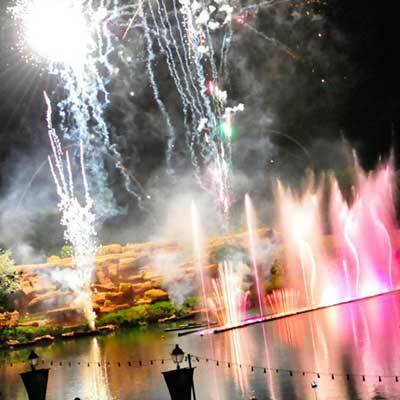 Parade, fireworks, pyrotechnics – everything you need for a great evening. Held on various evenings through the summer and open until early morning, celebrate the summer nights in style. With many special acts and different events in the park it’s worth staying up for.